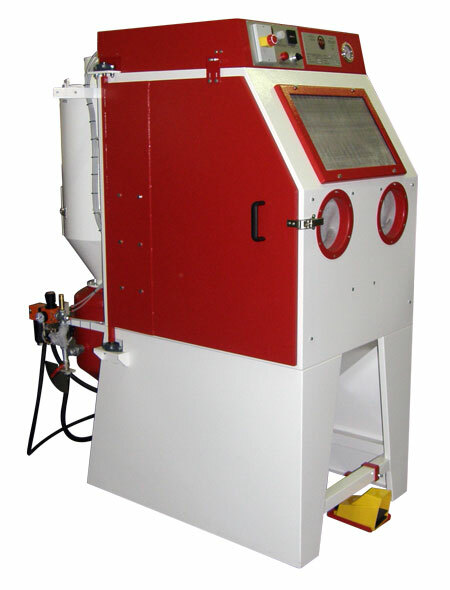 Cabinet sandblaster with self-cleaning cartridges | Sabbiatrici e Pallinatrici Fe.Vi. What are the advantages of FeVi Italjet PLUS sand blaster? 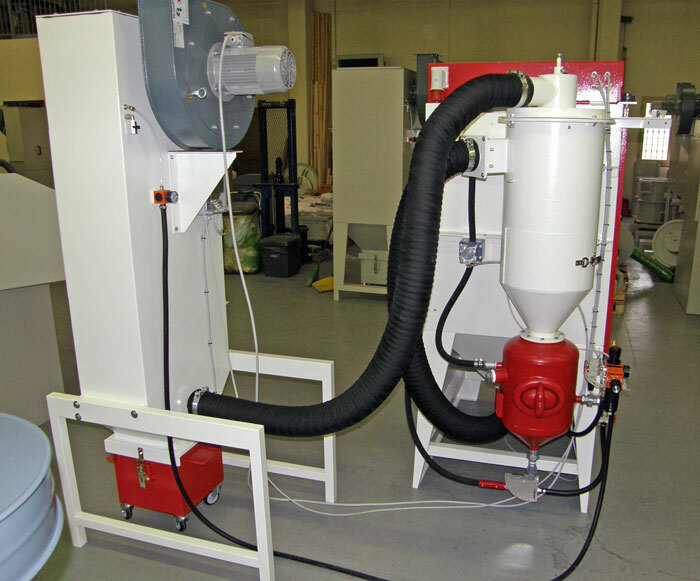 FeVi Italjet PLUS sand blaster uses a "pressure" system to propel the abrasive. The abrasive is propelled by a special gun which is connected to a tank containing aggregate, by an abrasion resistant pipe. Delivery pressure of the tank generates the abrasive push throughout the pipe up to the gun; the abrasive comes out of the gun shaping a continuous, high-power and large-scale jet. (about 4/5 times higher than a corresponding standard vacuum sand blaster). 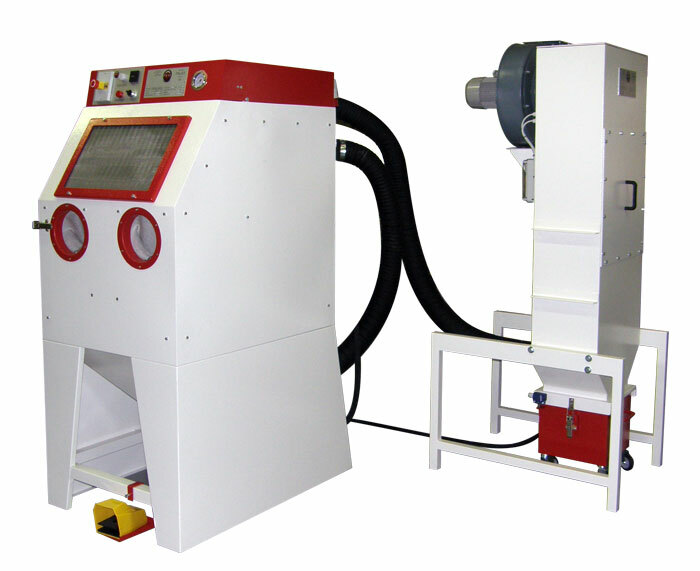 In the rear, FeVi Italjet PLUS sand blaster is provided with a system called cyclone constantly recovering and removing the abrasive used. It is a two-way suction cyclone allowing to work with a wide range of abrasives. FeVi Italjet PLUS pressure sand blaster is provided with a filtration system with self-cleaning cartridges. Filtering devices are made of polyester, instead of paper, hence extremely solid. Timed cleaning occurs by a system of automatic blow moulding. Each detail of FeViItaljet sand blaster is treated with the utmost care: a search for the best components ensures the best working conditions and safety for the operator, both in terms of structure and reliability. 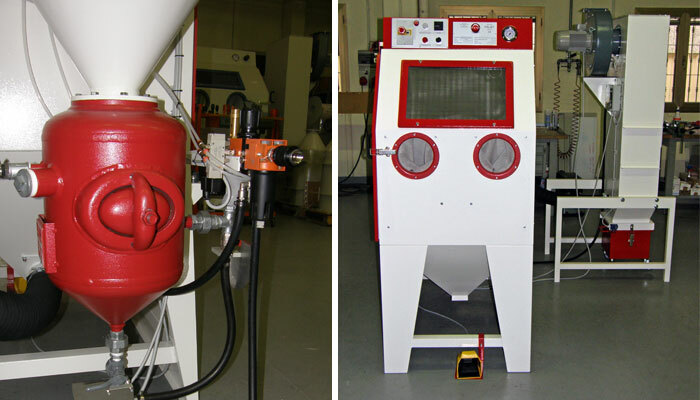 Although concerning an industrial system, FeVi Italjet PLUS sand blaster dimensions take up the minimum space required. Thanks to the maximum compactness of the two units, it is always easy to find it a dedicated area in the work environment. - sandblasting steel-structured gun with tungsten carbonide nozzle (widia) with a 4mm hole. - blow gun to dust pieces after treatment. - side door to fix the structure carrying objectholder disc. - interlocks for safety preventing from sandblasting gun operation when door is open. window with laminated safety glass protected by aluminium barrel reinforcing mesh. abrasion resistant gloves with gauntlets. a three-way electric power supply valve . One-way allows electric power supply, and the other one blocks it simultaneously causing all machine circuits discharge. - suction control instrument (vacuum switch). 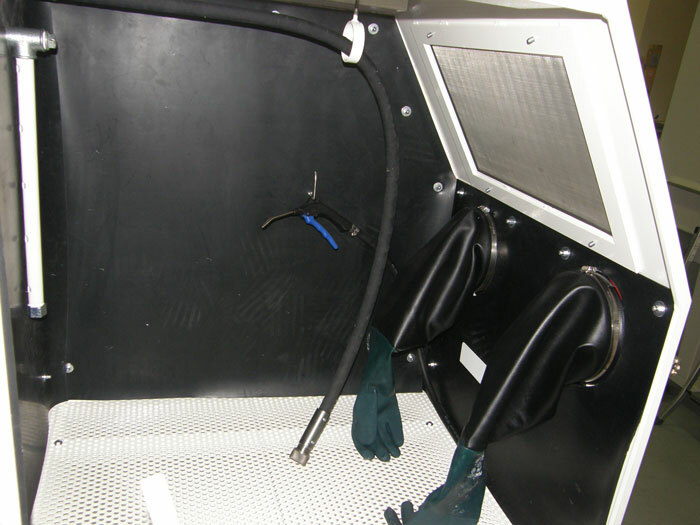 The tool prevents sandblasting gun from operating in case of insufficient suction in cabinet. A warning signal on electrical device panel indicates its activation. - abrasion resistant rubber sheets on walls inside work area. - abrasion resistant rubber internal coating, 6 mm thick in abrasive circulation area. 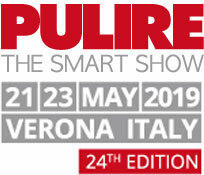 - mesh filter to spot possible rough residues. Cyclone setting allows to work with a wide range of abrasives and to achieve effective dust removing. - rapid depressuration valve. Valve rapidly discharges pressure from tank, immediately arresting sandblasting when the operator releases the pedal. When work process stops, abrasive is automatically refilled in tank, which takes approximately 15 seconds. Provided with self-cleaning cartridges and with a cleaning automatic system of filtering areas. F2C-9 filter model provided with 2 filtering cartridges. Total filtering area: 9 m2. Filter is provided with high head vacuum (1.5 HP). Made of polyester, highly resistant to possible mechanical vibrations. Large and non deep folds to avoid dust compression on surface. 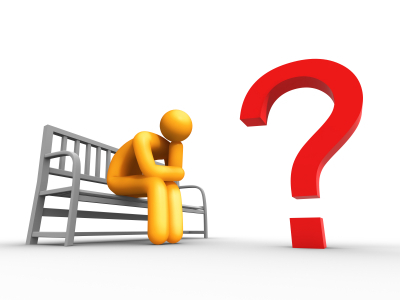 Compression occurs when narrow and deep folds are used to work large surfaces with smaller size cartridges. At 6 bars with a 4mm nozzle, consumption is about 1100 litres/1'. At a lower pressure, consumption proportionately decreases. three-phase 400 Volts, 50 HZ, with approximately 24 Volt auxiliary circuits. The system is worked out according to the best technique and with components of ensured quality. All cables are identifiable according to instructions provided in wiring diagram. About 1,5 kW total power draw. Support disc for wheel rims, mounted on door (with manual rotation). Provided with sealed bearings and a 600mm diameter. Maximum load kg 30. Disc is mounted with a 30° inclined axis to the vertical plane. The inclination allows an easily reachable position to work on the whole rim. posées sur le monde du sablage. Le nouveau canal vidéo de formation gratuit pour mieux connaître le monde des sableuses.